Cleans where there is no electricity! Compact and portable for all those hard-to-reach spots! Scrubber head is immersible in water! Telescopes to 8.5 feet for an incredible 13 ft. reach! 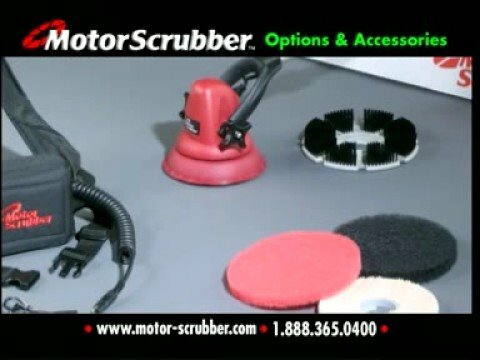 Includes scrubber head & handle, backpack & battery, 5 ft. coil cord, padholder, an assortment of the most popular interchangeable "twist-lock" scrub brushes, battery charger, and complete operating instructions and warranty. Battery provides up to 4 hours of "start & stop" use on a single charge.